We are here to help you savor your vacation experience by providing articles, maps, videos and assistance you need to thoroughly research, book and share your next vacation! If you know where you want to go, simply choose a destination to begin your planning process. You can find things like activities, events, points of interest, lodging options, special vacation packages, local travel tips, weather information, and maps for all of our destinations. Springtime is a great time to get out and enjoy the beautiful weather and nature at its finest. There is, of course, also spring break which is a great time to embark upon an amazing getaway to escape the hustle and bustle of the school year. Whether you are a family looking for something fun while the kiddos are on break or a college student looking for a way to unwind after midterms, one of these cities is sure to be a great destination for your spring vacation. VME books for cities all over the United States and in Canada, so whether you want a mountain adventure or a beachside trip there is something for everyone. For a spring break getaway, there truly is no better destination than San Diego, CA. This beach town is full of amazing attractions and activities to accommodate any sort of spring vacation. 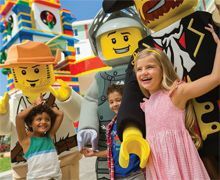 If you are traveling with family, there are activities such as the San Diego Tour: Hop-on Hop-off Trolley, San Diego Safari Park, and Legoland California Transportation and Admission. San Diego is also known for its beautiful beaches and ocean. If you are wanting to experience this, embark upon the Whale Watching w/Birch Aquarium Naturalists tour, or explore the waters with San Diego Surf Lessons, Stand-Up Paddleboarding Lessons, or the San Diego Harbor Speed Boat Adventure. San Diego is also home to a variety of family-friendly parks including Seaworld San Diego and the San Diego Zoo Transportation and Admission. For those who are foodies, one of the San Diego Dinner Cruises or San Diego Brewery Tours is a great go-to activity. Visitors can also embark on shopping opportunities on the Tijuana City and Shopping Trip from San Diego or opportunities to explore the city with tours like the San Diego City Tour. At the end of the day, you will be able to return to your luxury hotel or a comfortable bed and breakfast to enjoy some rest and relaxation. No matter what sort of spring break adventure you are planning, San Diego has something for everyone. Branson, MO is another amazing destination for spring break-goers. This Ozarks Mountain city is known for a variety of awesome activities, shows, and theme parks which can help to make your vacation memorable. For those who are seeking some thrills, Silver Dollar City is home to awesome rollercoasters and famous rides such as the absolutely unique Time Traveler, a ride that features three inversions, a 95-foot tall vertical loop, and a 90-degree vertical drop. 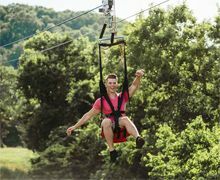 There are also other activities that are great for adrenaline seekers such as the Vigilante Extreme Ziprider, the Gravity Bomb at Bigfoot on the Strip, and Ozark Off Road ATV Adventures. Of course, Branson is also known as a family-friendly city with plenty of fun for all ages. Guests can visit Branson’s Wild World to see the animals, see the views from the gorgeous Inspiration Tower, or head to the famous Butterfly Palace and Rainforest Adventure. There are museums, too. Learn the story of the infamous tragedy at the Titanic Museum or learn about the weird and wacky at the Ripley’s Believe It or Not Museum. While you are in Branson, be sure to catch one of their famous dinner shows with Dolly Parton’s Stampede or the Showboat Branson Belle Lunch & Dinner Cruises. Top off your vacation with a great hotel such as the Cabins at Grand Mountain or the Hampton Inn on the Strip to stay close to all the action! One of the most popular destinations for spring break is Orlando, FL. Orlando has a multitude of attractions that provide tons of fun to everyone who visits. 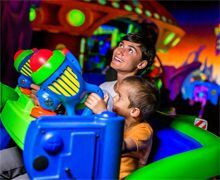 This popular Florida city is home to countless theme parks including Walt Disney World Theme Parks, SeaWorld - Orlando, FL, WonderWorks Orlando, and Universal Orlando Resort. So whether you and your crew want to ride the teacups at Disney or visit Hogsmeade at Harry Potter World, your vacation will be a memorable one. During the evening, there are tons of fun activities to take part in. The Sleuths Mystery Dinner Theatre combines drama with mystery and delicious food; the One Hour Airboat Ride at Night allows guests to explore the Florida ecosystem in a brand new way; and a visit to Pirate’s Dinner Adventure Orlando brings some swashbuckling adventure to your vacation. Guests can also enjoy the most gorgeous parts of Florida through natural means on the Dolphin Encounter Tour, the Florida Adventure Tour with Manatee Snorkel, and the Florida Adventure Tour with Optional Paddle Boarding & Kayaking. Learn about these animals at places such as Gatorland or Sea Life Orlando. Orlando is an amazing place to be no matter the time of the year, but enjoy a fun getaway during April to enjoy springtime events and more!